On a 21-kilometer-long, 400-meter-wide L-shaped island off the north coast of Yucatán, Cancún is a purpose-built luxury resort with an excellent tourist infrastructure. This large vacation center was built up from virtually nothing in little more than a decade and is now one of the most visited destinations in Mexico, attracting more than four million tourists annually. It's blessed with glorious white-sand beaches, coral banks, and near perfect weather. The prime tourist area is linked by a causeway to the mainland on which the modern city of Cancún itself stands, a vibrant hub with a number of interesting attractions worth visiting (assuming you can drag yourself away from the beaches). Most of Cancún's many resorts are built with direct access to the beaches - known locally as "playas" - with stunning views over the sparkling, crystal clear waters that make the destination so popular. Cancún, in fact, consists of a number of beaches, and while regular visitors may have their preferences, it's hard to go wrong. Among the most popular playas are de las Perlas, Juventud, Linda, Langosta, Tortugas, Caracol, and Chac-mool, some of them lying alongside the Boulevard Cancún and the Paseo Kukulkán all the way from the city boundary (of these, Tortugas, Caracol, and Chac-mool tend to be the busiest). 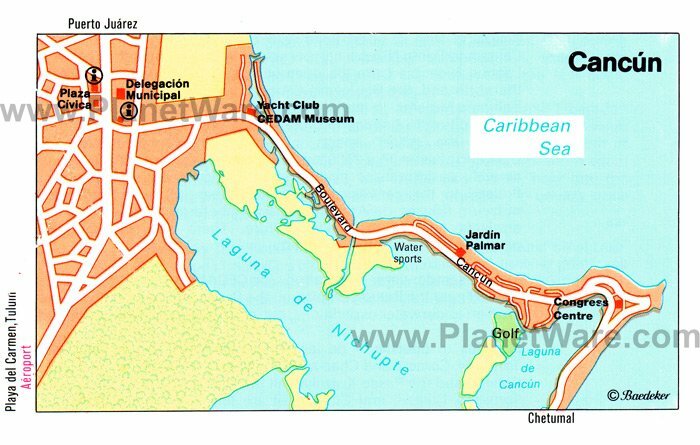 Also of interest is the seven-and-a-half-kilometer-long Paseo Kukulkán, alongside which is an 18-hole public golf course known as Pok-ta-Pok. Just a few minutes away from the Punta Nizuc end of Cancún are a number of interesting Mayan ruins known as El Rey. They are named after a mask found here that was believed to be dedicated to the sun god. Known as the El Rey Ruins (Las Ruinas del Rey), the site includes the remains of some 47 buildings along with numerous tombs built by the Mayans from AD 900 onwards. Of particular interest are the two main platforms with their temples, once part of the market and important ceremonial areas. It's well worth taking the time to visit, and many resorts offer inexpensive outings to the site, which is also famous for the large colonies of Iguanas that live there. In the Cancún Center, the city's large convention complex, the Maya Museum (Museo Maya de Cancún) is worth visiting to learn more about the region's rich history. The largest such museum project since the opening of the Templo Mayor Museum in Mexico City in 1987, this superb attraction does a good job of explaining the ancient roots of the region's Mayan culture, from its founding centuries ago to the modern day. Highlights include some 350 artifacts spread across three halls, most from in and around Cancún, including skeletal remains found in Tulum that date back 14,000 years and the remains of the famous 10,000-year-old "Woman of the Palms." Other highlights include displays of Mayan architecture and art, including sculptures from Chichén Itzá and the adjoining San Miguelito archeological site. One of the most unusual attractions in this resort town is the Cancún Underwater Museum (MUSA). Set up in 2009 in the wake of storm damage to the Cancún National Marine Park, this seabed-based attraction is dedicated to the "art of conservation" and is a delight for divers to explore. The core of this unique art collection are the more than 500 sculptures spread across two underwater galleries (a few are located on land in a nearby mall) submerged at depths of between three and six meters and encompassing human figures in a variety of poses (there's even a concrete car). Put together by six artists from Mexico and Britain, the sculptures will ultimately form the basis for new coral reefs. Hot Tip: If diving is not your thing, this remarkable collection can be viewed from the comfort of one of the many glass-bottom tour boats that ply the waters. Another interesting Mayan site that is easily accessible from Cancún's main resort area - this one located at the north end of the main beaches - is the El Meco Archaeological Site. Originally inhabited around AD 300, it rose to prominence as a Mayan trade center from the 1100s until its decline after the arrival of the Spanish in the 16th century. Of particular interest is the 12.5-meter-tall El Castillo, the only pyramid of its kind to have been built in the area. Perched atop the pyramid are the remains of an old temple from which you'll be rewarded with stunning views over the coastline and Isla Mujeres. A good place to get a close-up view of the area's rich marine life is at Cancún's Interactive Aquarium. After donning flippers and a snorkel, you're free to swim around the facility's enclosures surrounded by numerous species from stingrays to seahorses and clown fish. The real highlight, however, is the attraction's "swimming with dolphins" experience, an exciting program that allows you to get up close and personal with these gentle sea creatures. Similar programs are also offered at two other nearby venues: Dolphin Discovery and Dolphinaris Cancún. A must-do while in Cancún is to take a trip up the Scenic Tower (Torre Escenica). Something of a landmark in the hotel district due its height - it's 110 meters tall - as well as its pencil thin base, the tower is a fun diversion for those wanting a birds-eye view of the city, as well as its many beaches and the surrounding coastline. While a set of steep steps can be climbed, by far the best way to reach the top is to simply take a seat in the large round elevator that gradually, as it rises and rotates, becomes an observation deck. It's a particularly attractive structure at night when it's lit up to resemble a Mayan representation of a flower. Another destination that is closely associated with Cancún is the lovely Isla Mujeres (the Island of Women). About 13 kilometers from the mainland and just a short hydrofoil ride from the pier at the convention center (Cancún Center), this long skinny island - it's just seven kilometers long and 650 meters wide - is particularly popular among surfers for the larger waves experienced on its east coast, while divers love the abundant marine life surrounding its numerous coral reefs. It's also popular with beachgoers who enjoy the less hectic pace: traffic on the island is limited to taxis and buses, all of which are vastly outnumbered by golf carts and scooters. Isla Mujeres is also a popular day trip destination for those staying elsewhere on the Maya Riviera thanks to its many fine restaurants offering excellent views over the water to Cancún. Few visitors will want to miss the chance to spend at least a little of their vacation time visiting one or more of the larger Mayan ruins within reach of Cancún. One of the most popular day trips is to Chichén Itzá, three hours west of the beaches and one of Mexico's largest and best-restored archaeological sites. Settled by the Mayans more than 1,000 years ago, this UNESCO World Heritage Site includes many famous Chac-mool statues, along with important buildings such as the 30-meter tall El Castillo, one of the country's most famous pyramids. Tulum, just one-and-a-half hours south, is a better option for those pressed for time. Famous for its cliff top location and for being the only known fortified Mayan coastal town, Tulum contains many other unique structures in addition to is tall, wide walls, most noticeably its Temple of the Frescos with its sculptures and reliefs depicting seated figures with elaborate headdresses. The site's largest building, the Castillo, is also its most famous, perched as it is on the cliff-edge overlooking the sea. The Ritz-Carlton, Cancun: beachfront luxury, sea view rooms, sumptuous bedding, award-winning restaurants, lovely pools, kids club, wonderful spa. The Royal Sands Resort & Spa All Inclusive: mid-range all-inclusive, timeshare resort, personal concierge, infinity and kids' pools, restaurant with theme nights, spa and beauty salon. Fiesta Americana Villas Cancun: affordable rates, large rooms, outdoor pool, kids' and teens' clubs, Mexican-inspired spa treatments. The Royal Islander All Suites Resort: budget-friendly rates, oceanfront, seven dining options, multiple pools, tennis courts.